This t-shirt shows a happy fellow and why is he happy? Simply because he pooped today and that is what is printed below the picture. 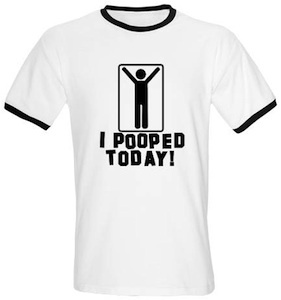 You have to admit that if you like bathroom jokes that this is the perfect t-shirt for you. And it comes in different styles so no worries you can wear a different one every time you poop. Go check out this I Pooped Today! T-Shirt.